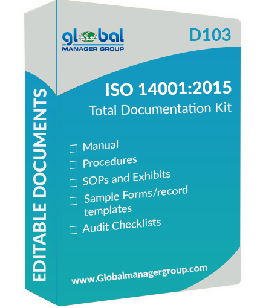 The Global Manager Group, leading ISO documents and ISO training presentation kit Seller Company has updated its product C117, named as ISO 50001:2018 awareness & auditor training presentation kit for setting up and managing an effective Energy Management System (EnMS). International Organization for Standardization (ISO) has published new ISO 50001:2018 standard on 21st August, 2018 and replaces the current standard ISO 50001:2011 that brings in a much stronger focus on continual improvement in energy performance with greater involvement of leadership and employees. Many new changes are added in this revised ISO 50001 auditor training presentation kit. It helps to establish a much better understanding of the ISO 50001:2018 awareness and internal auditing. The newly revised ISO 50001 training ppt presentation kit provides more clarity and includes 6 items. ISO 50001 awareness training kit includes more than 180 editable ppt presentation slides on 7 modules including overview, objectives and energy management plan, requirements, steps, documented information, internal audit etc. It also includes handouts, workshops and case study, more than 500 audit questions, audit record templates and sample auditor training certificate as per ISO 50001:2018. Global Manager Group provides ISO 50001:2018 auditor training presentation kit at very compatible cost of USD 450, and prepared in MS PowerPoint and Word documents and written in simple English. This ppt presentation kit is an editable document so any user can modify it as per their requirement, and use it as internal auditing for their organization. Global Manager Group, leading name in selling ISO documents and ISO training kits worldwide proudly announces its new product C124 – HSE – 2018 Awareness & Auditor Training Kit which is a complete guide in ppt presentation and gap analysis kit to understand Health Safety Environment Management System requirements as per ISO 14001:2015 and ISO 45001:2018 standards. Readymade HSE Training ppt is designed by experienced team of ISO auditors and consultants with taking care of each requirement of EMS and OHS&MS. It is useful while conducting corporate training sessions to learn health safety environment management system requirements and internal auditing for HSE Certification in any organization work area. HSE training ppt presentation kit saves precious time while preparing the HSE awareness training course materials for in-house training programs. This HSE auditor training presentation slides are aim to prepare the organizations’ employees for how to face HSE audits. The HSE training – ppt presentation described in 11 main modules comprises of more than 410 editable ppt slides that includes HSE system overview, ISO 14001:2015 and ISO 45001:2018 standards requirements, installation steps, internal audit, documented information, etc. The training kit also comes with trainer’s guide, case studies, workshops, sample auditor training certificate and more. The contents of the ppt presentation kit will be most beneficial for ISO consultants and Internal Auditors to understand all the requirements of integration of newly published standard ISO 45001:2018 with revised standard ISO 14001:2015 of the organizations. Using this training material they can easily guide their clients and employees of their organizations to achieve maximum outcomes of HSE system implementation and certification. The training kit is launched to sell online at rate of just 450 USD, which is very competitive price as compare to other products of Global Manager Group. Users can download Free Demo to find out more about how it can help organization in HSE training and integrated HSE certification. 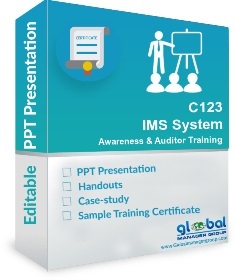 Global Manager Group, leading name in selling ISO documentation and training kits proudly announces its new product C123 – IMS Awareness & Auditor Training Presentation Kit designed by experienced team of ISO auditors and consultants, which covered requirements of each clause and sub clauses in detail. Global Manager Group introduced readymade IMS auditor training kit is complete guide in ppt presentation and gap analysis kit to understand Integrated Management System (IMS) as per latest ISO 9001:2015, ISO 14001:2015 & ISO 45001:2018 standards requirements. It is useful for those organizations that want to quickly and efficiently learn how to implement and successfully clear the audit for IMS Certification. IMS training presentation kit saves precious time while preparing the IMS awareness training course materials for in-house training programs. This IMS training presentation slides are aim to prepare the organizations employees for how to face ISO audits on integrated management system. The IMS training – ready to use ppt presentation described in 13 main modules comprises of more than 510 editable ppt slides and MS- word documents like audit forms, checklists and more that help you to customize your own audit checklist. The training kit also comes with the case studies and workshops. This presentation kit of IMS training available at very exciting rate of just 450 USD with Free Demo and will offer full value for the money spent by the customers globally. Moreover, the information can be edited so that you can craft your presentation quite easily as well as prepare the entire training presentation fast which saves your valuable time. 30 Jan 2018, Alkhobar, KSA – Future Development Services Co. (FDS) and Global Manager Group are jointly announcing the one day training program on “ISO/IEC 17025:2017 Changes and Transition” at Al Khobar and Jubail, Kingdom of Saudi Arabia on 5th and 6th February, 2018. The ISO 17025-2017 training program will be helpful and beneficial for participants from ISO/IEC 17025 accredited laboratories in Saudi Arabia. As FDS confirmed Mr. Devang Jhaveri will be delivering one day training program on recently released ISO/IEC 17025:2017 standard. The course will guide participants with knowledge of key changes and requirements in transition to ISO/IEC 17025:2017 accreditation. The trainer has rich experience of more than 100 laboratories ISO/IEC 17025 consultancy, this course will help participants to gain an understanding of transition for laboratory conformity assessment activities to make their own system and prepare for transition to ISO/IEC 17025:2017 and prepare the documents. The ISO/IEC 17025 Changes and Transition – 1 day training is organized at Al Khobar, KSA on 5th Feb 2018 and at Jubail, KSA 6th Feb 2018. Organizations and laboratories of Saudi Arabia, which wants to train their laboratory employees to understand ISO 17025:2017 transition requirements can participate in this event, it will be the best opportunity for such laboratories. After completion of this course, all participants will receive a training certificate for ISO/IEC 17025:2017 training. Mr. Devang Jhaveri is owner of Global manager group, has been providing management training and consultancy since 1991 and has more than 2700 clients in more than 45 countries. Devang had the experience of more than 30 years in providing ISO certification consultancy and management consultancy and globally more than 100 laboratory consultancy and many public training courses. So far he has conducted more than 70 courses on ISO/IEC 17025 and many laboratories have got accreditation for ISO/IEC 17025 under his project management in GCC including leading refineries, Gulf Laboratory, Buzwair, Al-Hoti, Ministry of Works (Bahrain), Q Chem., International Laboratory, Doha Technical Lab, Qatar Engineering Lab etc. VENUE & DATE: 5-Feb 2018, TBA – Al Khobar, KSA and 6-Feb 2018, TBA – Jubail, KSA.